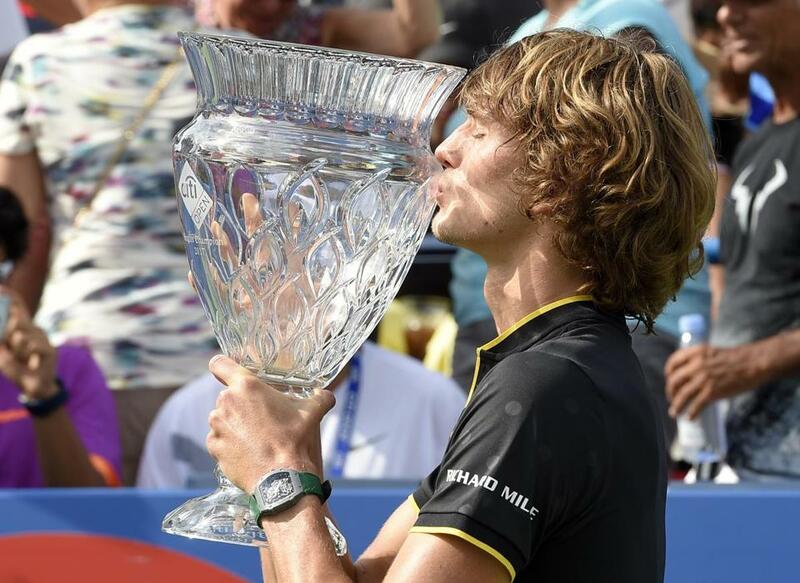 Alexander Zverev kisses the trophy after winning the Citi Open tennis tournament in Washington Aug. 6. Zverev, a 20-year-old German considered the "Next Big Thing," will play under the lights in Arthur Ashe Stadium on Monday on the first day of the US Open. NEW YORK — After a bunch of bad news about big names missing the US Open, the folks who run the tournament are searching for a silver lining. Who could blame ‘em? They figure there’s no time like the present to promote the future stars of tennis. At least Roger Federer and Rafael Nadal still will be in the field when play begins Monday, although even that didn’t quite work out for the U.S. Tennis Association and its TV partners. The presence of the two greats — and the tantalizing prospect of what could be their transcendent rivalry’s first installment at Flushing Meadows — is not as enticing as it could have been, because the luck of the draw set up the bracket so they only could meet in a semifinal, not the final. There’s a significant drop-off in wattage from there: An event already without the sport’s top woman, 23-time major champion Serena Williams (she is pregnant), will be contested without three of the top five members of the men’s rankings, and five of the top 11. Andy Murray, the 2012 champion and No. 2 seed, became the latest to pull out when he unexpectedly withdrew Saturday, citing an injured hip that could sideline him for the remainder of the season. That followed withdrawals by reigning champion Stan Wawrinka and the man he beat in last year’s final, Novak Djokovic, a two-time champion and five-time runner-up in New York. Also absent: 2014 US Open runner-up Kei Nishikori, meaning just one of the 2016 men’s semifinalists returns, and 2016 Wimbledon runner-up Milos Raonic. To that end, Widmaier said, the USTA is putting more effort into telling fans about American players who might not be household names — ‘‘who to watch out for and why they’re going to succeed’’ — and up-and-comers from other countries. One example: Alexander Zverev, a 20-year-old German considered the ‘‘Next Big Thing,’’ will play under the lights in Arthur Ashe Stadium on Monday. Widmaier said Zverev or Nick Kyrgios, a talented and volatile 22-year-old Australian, could be the focus of TV, print or digital promotion that otherwise might have put Djokovic, Murray or Wawrinka in the spotlight. That is a good thing for tennis, which will see a generation of significant players on its way out in the coming years. Federer, after all, is 36. Wawrinka is 32, Nadal 31. Djokovic and Murray are 30. Williams turns 36 next month; her older sister Venus is already 37, the oldest woman in the draw. Those seven players own a combined 82 major singles titles. Federer, for one, does not think the preponderance of injuries among leading men is a worrisome trend. He offered a rather simple take. ‘‘It’s mostly because they are 30-plus. Wear and tear just takes its toll. Maybe some players have just had enough of playing hurt and just told themselves: ‘When I come back, I just want to be 100 percent. Not always playing at 85, 90, 95 percent. It’s just not fun this way,’’ he said. Another possible reason for so many withdrawals is one far less likely to be remedied: It stands to reason that more men would accumulate injuries by the end of their long season, and the US Open’s spot as each year’s last Grand Slam tournament seems set.